We started the day at the Pinkham Notch Visitors Center. I had heard they add an AYCE breakfast, it was a no-brainer. The sun was shining, the air was cool. Perfect mountain climbing weather. 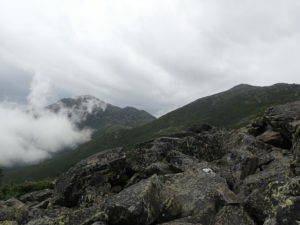 We climbed, and climbed for a few hours up Mt Madison. After we passed the treeline the sky turned grey and the rain started falling. The climb to the top felt like it would never end. We quickly climbed down the summit to the Madison Spring Hut. The rain picked up and the wind started to pick up. We were hoping for a work for stay so we didn’t have to set up in the rain, however they already had those spots taken. The closest place to set up camp was a 0.6 mile, straight down, trail. No other options were available. So down we went and set up camp. The winds kept us up all night. A few times the stake holding the vestibule down on my side popped out and would flap out of control. “Where are you headed to? Maybe you should just stay at the Madison Hut.” – well, it doesn’the work like that. “You’really almost there!” -actually no, we just left the tent site and our day doesn’the truly start until we are back on the AT headed towards Washington. At the Hut we find some hot coffee, but no breakfast leftovers or baked goods for sale. Womp, womp. They did, however, have the forecast posted for the day. Expected temperature for the day was low 50s with 55-65 mph winds and gusts up to 90 mph, and rain likely. After we got going we adjusted to the wind and with the warmer temperature the rain wasn’t too bad. The AT routes you through the presidential section around the summits. 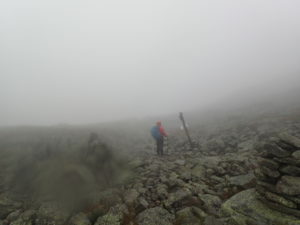 As we weaved around Mt Adams, Mt Jefferson and Mt Clay we would have moments of hard wind and rain, then moments of minimal wind and rain. At one point we found a cairn larger than us, so we hid behind it to take a snack break. 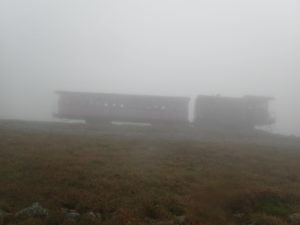 As we neared Mt Washington, we heard a really weird sound. I looked to my right and it was the Cog! I had no idea it was so close! Visibility was so low, it was pretty much just a passing shadow. 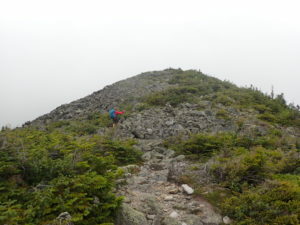 The rest of the climb up was fairly easy until we reached the 0.2 to the summit. That last section is where the winds picked up. It was hard to stay upright. The summit then just popped up out of nowhere. At the top there is a few buildings and a parking lot. Because visibility was so poor we couldn’t even see the buildings. After meandering around for a minute or two we found the snack bar. Yes, a snack bar! We both inhaled 2 chili dogs and a bowl of clam chowder with a Coke to wash it down. The thoughts of chili dogs were what kept me moving all day. A few weeks prior we had gotten the tip about the snack bar on the top of the summit, and I will have to say the chili dogs did not disappoint! I didn’t want to leave. The last thing I wanted to do was go back out in those conditions to go to the Lake of the Clouds Hut and beg to let us stay for the night. But, we headed out anyway. The 1.5 mile hike to the Lake of the Clouds Hut was mild compared to the trail from the rest of the day. We opened the door to the Lake of the Clouds Hut to find a full house of guests and about 15 thru-hikers sitting around. It didn’t look good. I chatted with a member of the croo and found there were no work for stays available and the dungeon was full for the night. She turned around to talk to another worker to see if they had room for us. Thankfully, they gave us the option to pay $10 to sleep on the floor in the dining room. We quickly accepted. I woke up in the middle of the night to light shinning through the window. I couldn’t believe my eyes. It was a full moon and not a cloud in the sky. The valley below and the peaks were finally visible. It was so unbelievably beautiful! So why do I say I became a thru- hiker during these days? I finally feel like I have earned my place on the trail. 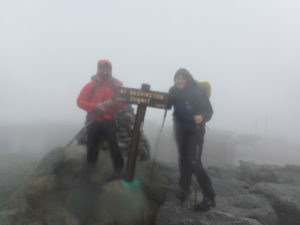 Our day hiking to Mt Washington was so intense, it gives us our “street cred.” I have some trail updates to do still, but we are now in Vermont. It feels good to be done with The Whites. The tables have turned and the northbounders we meet no longer try to fear monger us about The Whites. It’s our turn to tell our stories of the area.